Troeger shares the secrets of capturing the imaginative spirit through exploration of the creative use of sight, sound, touch, and taste that leads to new visions for truth-telling and revelation in the sermon. Here is the remedy for trite, boring sermons! Thomas H. Troeger shows how to breathe fresh life into your sermons by harnessing your imaginative powers in a new way. In scores of dynamic workshops, Troeger has shown preachers and seminarians how to create powerful sermons by seizing moments when the heart and mind catch fire. Now, in Imagining a Sermon, Troeger shares the secrets of capturing the imaginative spirit within you. You will discover how to observe daily events that can energize the preaching event. You will also discover how to fine-tune your visual and listening skills to fuse televised, scriptural, and remembered images into new truths for your congregation. 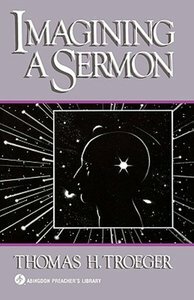 About "Imagining a Sermon (Abingdon Preacher's Library Series)"